As expected, the Perfect Portable Project, version 2.0* is zipping right along during my waiting-for-Caleb-time. I'm somewhere around the halfway mark. I think. I haven't measured it yet. I actually briefly considered putting it away yesterday so I wouldn't finish it too soon, but then I remembered that I have yarn for another one here in the stash, I should have enough yarn leftover from this skein for a second one just like this (Christmas is coming faster than any of us want to admit), and I happen to know where to get more yarn, if I should happen to run out. I realize the loop scarf may be a trendy or dateable thing in years to come, but if you look at the pictures on the link above, it can also be worn as a capelet (technically a classy poncho) and as a cowl, so I think that if I get a little crazy with these, it will be OK. 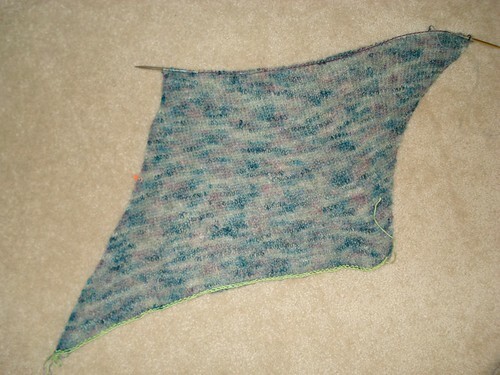 I think it's important to tell myself that periodically - it will be OK.
*Perfect Portable Project, version 1.0 is the Silky Alpaca Lace Shawl that I knit twice during the Summer and Fall of 2009. Acres and acres of mindless garter stitch, perfect for sitting and waiting. Someday I will have a whole list of perfectly mindless patterns for sitting and waiting and talking to strangers who are wondering what I'm crocheting that would otherwise be mind numbingly boring.